I’m cross posting this with DC Vacant Properties. 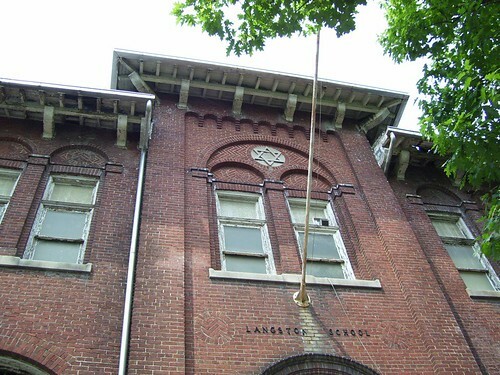 There is no point to using an updated photograph of the Langston School. It was rotting away 10 years ago when the picture was taken in 2007, it is still rotting away now and the way things are going, it may be another 10 years before the city actually brings this property back to the land of the living and legit. This property is a vacant school in the DC government inventory. It was a school from 1902 til the mid-1990s. In 1997 it was a homeless shelter. By the time I moved here in the 00s, it was a vacant husk and only a homeless shelter when the homeless and others broke in. In 2013 it got on the National Register for Historic Places, so there is that. Around 2012 Langston was offered to charters, who have 1st dibs, and nobody wanted it. No charter wants it because it is an unmaintained structure with a rotted roof that is in need of a serious rehab work. Even Mundo Verde Charter School, across the street, which took over the still functioning Cook School building and built an addition, hasn’t seriously pursued it. Langston is too far gone as a building to be of any use to a school. Another complication is in the Slater School, another building that shares a playground with Langston. It is A.R.E. ARE is a social service organization and a daycare and it looks like they are also getting in on the Pre-K thing too. Slater is a poorly maintained building, but the tenant ARE holds on tight to its location. I strongly suspect ARE has powerful friends that are protecting ARE to the detriment of the Langston building. 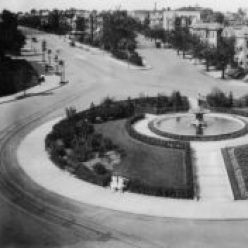 I suspect this because for at least a decade now, when residents bring up the nuisance property that is Langston to city councilmen or the council staff or city staff who show up to the local meetings, they seem to have no idea it exists and fail to get back to residents with a satisfactory answer. The civic association for the area BACA, has recently formed a committee to try to figure out what could be done with Langston. This is DC Government property. It is the Government of the District of Columbia’s responsibility. Any demolition by neglect would be purely the fault of the local government. The DC government has failed the residents of the unit blocks of P and Bates. But then again, the DC government is a crappy property manager.